Sarge, and his rider, made an appearance at the Northern Lights Lantern Festival on August 14. 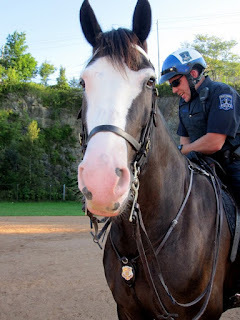 I asked the officer if there was an advantage to riding a horse over driving a car or riding a bicycle. The officer told me that being on a horse has two main advantages. A) People who wouldn't normally come talk to the police, will come and talk with him because they want to see the horse. This allows him to become more trusted in the community. B) If crowd control is needed, then riding a horse is the best option since i) the rider can more easily see what's going on, and ii) rather than yelling and screaming to move people out of the way, the horse just takes a step and clears out the path without a fuss or problem. Sarge has his own badge too, as you can see around his neck. Fittingly, it's the badge of a Sergeant, which means he technically outranks his rider.